Arin Trook was the education director at the Aspen Center for Environmental Studies. He died Monday in an avalanche south of Aspen. ASPEN — Arin Trook, who worked at the Aspen Center for Environmental Studies as its education director for more than five years, was identified Tuesday morning as the skier who died Monday in an avalanche near Ashcroft. The Pitkin County Coroner’s Office said Tuesday that Trook died in the slide Monday morning when he was buried about a half-mile from the Markley Hut. Pitkin County Deputy Coroner Eric Hansen said Tuesday the cause is accidental and the manner is pending further autopsy results. Trook was married and had two children. In a statement Tuesday morning, officials at ACES said Trook dedicated his life and career to educating children and adults in the community and valley. “Arin’s talent as an educator is unmatched — from his engaging storytelling skills and deep understanding of environmental science to his ability to address diverse audiences with his message of progressive environmental and social awareness,” Chris Lane, CEO of ACES, said in the statement. Two funds have been set up to help the family, ACES announced Tuesday. A GoFundMe page has started on the website, and the Arin Trook Memorial Fund has been created through Alpine Bank. Donations can be done in person at any Alpine Bank or checks sent to the bank office in Aspen on Hopkins Avenue. According to the Pitkin County Sheriff’s Office, Trook and another skier left the hut and only Trook was buried. The friend who went out with Trook was able to ski down to where he thought Trook disappeared, poked around in the snow and located him, Pitkin County Sheriff’s Office officials said Monday afternoon. The man uncovered Trook and performed CPR on him, but could not revive him, said Capt. Jesse Steindler, patrol supervisor for the Pitkin County Sheriff’s Office. The man then went back up to the Markley Hut to get help and returned with others — including a Mountain Rescue Aspen volunteer who was in the backcountry with another person on a separate trip — and CPR was started again, but they could not revive Trook. According to ACES, Trook started as education director in September 2013, but he was a naturalist and educator at the nonprofit from 1996 to 2000. Trook was a graduate of Stanford and had a masters in education from Cal-Berkeley. During his career, Trook worked with Outward Bound, the National Park Service and at Lesley University in Massachusetts. 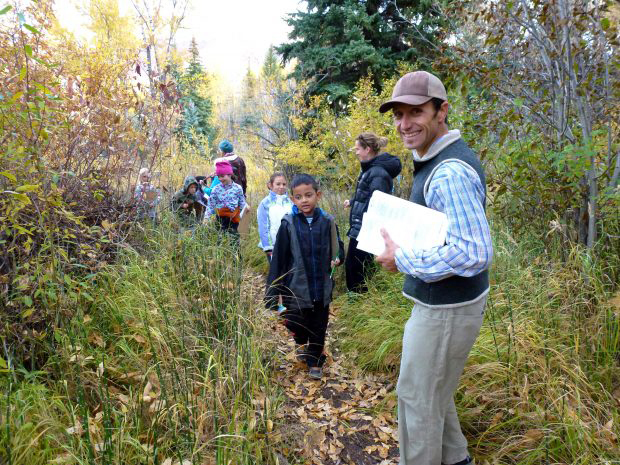 In his role as ACES’s education director, Trook was in charge of the organization’s environmental science education programs and worked at elementary and middle schools in the Roaring Fork Valley and out to Rifle. In March 2014, Trook wrote on the ACES blog that “the children of the Roaring Fork Valley give me hope for the future. As a recent transplant to the Roaring Fork Valley, and as a new member of the ACES community, I want to send out my appreciation to the youth of this amazing valley. Trook also was a well-respected yoga teacher who used the practice in nature. According to ACES, Trook created and taught the country’s first nature-based yoga teacher-training program. He worked at a number of environmental organizations in his career, including the Balanced Rock Foundation in Yosemite National Park.